Maybe a week ago, I was taking books out of what had been my mother’s home office. There’s a period after a death when it seems wrong to erase the person by removing all of their possessions as if they had never sat in that chair knitting, or used the rosemary mint conditioner in that shower. Then (and it’s hard to see this coming because it comes with such breathtaking stealth), there is a time when it seems wrong to leave everything in place as if the person was going to pop in and ask for her green sweater vest. It gets a little creepy, like on episodes of CSI in which the family has preserved the bedroom of the murdered teenager exactly as it was the day he was abducted from the crack house in a bad part of town. Anyway, it was time. So I assembled a bag of children’s’ books to distribute among deserving young friends, and noticed in the process that one book seemed to have another wedged into its printed heart. The interloper proved to be a slim, Florentine blank book. I was sure she’d bought it when we were actually in Florence, in the summer of 1977. Let me back up a bit. Let me say that, although I haven’t been writing about it (or anything else) much lately, I am still pretty epically sad. That day, the day I found the book, I was literally talking to myself out loud as I assessed the task ahead of me. “It’s okay, bunny,” I said (for some reason I call myself “bunny” in my head when I’m trying to be comforting) “you can do this. Just take little bits at a time.” And I’d be okay, and then not okay, efficient gatherer of books and then sobbing and pathetic floor kneeler. So given all that, when I opened the little book and found that my mother had started writing in it on December 31, 1985, when she was about 6 months younger than I am now, less than two years after the death of her own mother, I decided it was a sign. Although I did not take Physics in high school, I am told that the amount of energy in the universe is finite, that it all sticks around, and that it turns into other stuff upon its release from a given situation. (That is not a scientific explanation. I’m pretty sure that the word “situation” is rarely used by those searching for the Higgs boson particle to describe any state of matter, energy or anything else). Maybe, possibly, the book is some of my mother’s energy in tangible form. I can’t, quite believe that she is shimmering around in a column of white light, and I’m not ready to admit that she’s mostly in the air somewhere, or in the Red Cedar River, or in the lilac bush in the yard. I can believe that she radiates from the elegant, fleur delise’d pages of this book. So I saved it for today, December 31 of the most terrible year I could have imagined, hoping for a little hit of her incredibly fine and sophisticated energy. I care for myself. The more solitary, the more friendless, the more unsustained I am, the more I respect myself. In our sleep, pain that cannot forget falls drop by drop upon the heart and in our own despair, against our will, comes wisdom through the awful grace of God. My mother, who was not alone or friendless any more than I am now, was grieving in the little book. She was grieving the loss of her own mother, a loss about which she was neither mellow nor philosophical. In the midst of a loving family and a sea of friends, she felt alone without her mother, making her own way in the world like Jane Eyre, growing stronger through the pain that persisted “against her will” for so many months. In my universe, as I read, the atoms spun crazily from wherever she left them and moved into my own body, joining with all that is my present incarnation. A yellowing newspaper clipping fell from the back of the book; “For Bernice” is written in the upper left corner. Bernice was my mother’s mother. It’s a poem entitled “A Prayer for Every Day” by Mary Carolyn Davies, and my mother has copied it out as the last entry in her book. 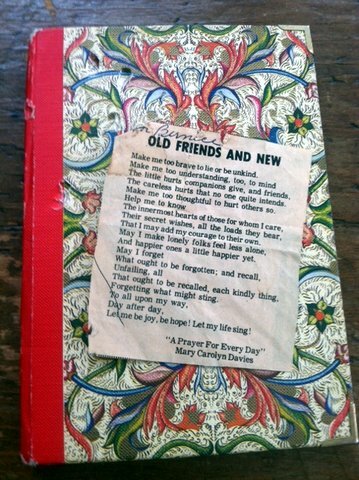 At the top of the page she wrote “For Bernice (found in a box of my mother’s belongings.” It’s kind of corny, the poem, and it probably seemed corny to my Yeats-reading mother, but she kept it, loved it, copied it out because it was a part of her mother. A transference of energy, if you will. And so today, as the world goes into overdrive with lists and retrospectives and hats and noisemakers, I will sit quietly in the house I grew up, listening to my father sleeping the deep sleep of recovery, keeping the little Florentine book nearby as talisman. I will not be sad to see this year end, but I am certain, in some totally unscientific way, that I’ll move forward relying on the strength of my mother, and her mother. (And your own strength, bunny). Posted in life and tagged Aeschylus, death, grieving, Jane Eyre, New Years, physics. Bookmark the permalink.